Reliable and Powerful Data Recovery Software. 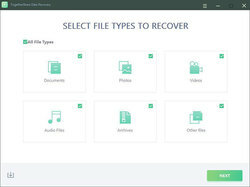 TogetherShare Data Recovery Professional 6.6 was available as a giveaway on December 30, 2018! - Preview and recover files. 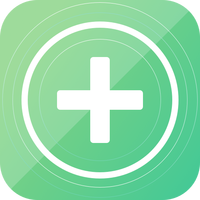 How would you improve TogetherShare Data Recovery Professional 6.6? Timing is everything. I just lost all my family photos when (2) different hard drives physically crashed at once. In a desperate attempt to salvage anything from old drives, I downloaded and installed on an XP Desktop, Windows 7 Laptop, a Surface Pro 3 windows 10, and (2) Windows 10 Desktops and began digging. I am also using EASEUS data recovery, so I'm able to compare. Today's giveaway is doing a rather good job. Seems speedy enough on each of these different platforms. There are a couple annoyances. I wish there were a way to select/deselect files to restore by using the space bar, or I wish I could select a file, hold the shift key, and click another, and select/deselect groups of files at once. Seems like you have to click click click each file. GAH. Secondly, I think I found a bug. One of my machines, if the program is already running and I insert a USB drive, the screens go black and the computer locks entirely. It's only doing it to one of the boxes, so there obviously is a conflict. Other than that, I'm really enjoying todays giveaway. It is recovering well, and the deep scans are taking a very long time, but they are doing a good job too. One more thing - it does not allow me to choose a NAS or mapped network drives to restore to. It seems to only allow restoration to drives actually hooked up to the device. I cannot believe that the program does not let me specify the directory or drive _before scanning. Am I missing something? The scan takes a looong time. I am not getting your Facebook share and download when I go to download the files can you please help. You can use a throwaway email, instead. You do not have to use Facebook. Heartbaeatau, You can use a throwaway email, instead. You do not have to use Facebook. consuella, I have used the email part of the share and download and it just sends me back the main web page where you have to click download and I get all the same things again. Then I would suggest that you clear your web browser's cache, cookies, and history. And try it again. Also I would use a different email address. 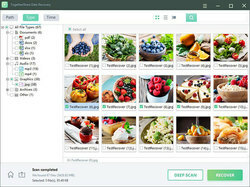 "Powerful hard drive data recovery software to recover deleted, formatted or lost data from hard disk drive, memory card, USB flash drive, digital camera or other storage device." To recover an overwritten file on Windows PC, open Windows Explorer and navigate to the folder where the file was located in. Right click anywhere inside this folder and select Properties from the context menu. After that, select the Previous Versions tab and look for an earlier version of the overwritten file. mtyboltar, how about making back ups first before you press the delete button, just in case you changed your mind or realized it was a wrong file deleted. Nothing else can recover a file as an already made duplicate of it in your archived drive(s). Are any of these programs, including this one, better than the multitudes of similar ones out there. 6. Offered the option of a deep scan which I assume will take longer - I didn't try this. 1. When you click the icon then nothing happens for a few seconds before the programme starts - there needs to be a "loading" screen or something to tell you something is happening. 3. Things are hidden in directory structures that make them very hard to find without spending a lot of time randomly clicking every directory structure to find where the files are you were looking for. There was a lot of empty directories and empty files here and I couldn't work out why they were being displayed - they had no recovered files in them, nor were there ever the type of file I was looking for in them either. Works also for mini sd card even new formatted, all my old photos and videos were recovered ! Great software ! Thanks ! TRACY , Formating does not destroys data sectors, try to copy few GB of data on top of it and then try to recover. That is how you will know if this software is good or not. Morris, If you overwrite it with data, how can you conceivably restore it? Surely overwriting with data is the one way to make something unrecoverable! Do you expect software to perform miracles like bringing back to life someone who has died and been cremated? TRACY , Morris is correct, in real world we delete something and then save something on top of it and then we realize we did something wrong and try to recover the data. Formating is intentional event and it does not over-write the data. Zen , in that case, why are you installing recovering software if that is impossible according to you? Most good software can recover such data, if you think that this one can not, skip the installation. Zen never said that he installed this program, but if did install it, he might be able now to use this program to recover data that were not overwritten. Marin, Zen never said that he installed this program, but if did install it, he might be able now to use this program to recover data that were not overwritten. consuella, Thank you. These programmes recover data that is not overwritten as you say. Morris suggested that they can recover data that has been overwritten, I fail to see how that can be done. Keeping backups automatically as you go, as Ginna said, makes these recovery programmes unnecessary anyway. kavka, It does not over write the data, but you need software to be able to get formatted data. If you look at a drive, in Windows platform for example, that you have formatted, it looks empty.You need software, such as this, to be able to get that data back. If you format a drive, and then write a new OS to a portion of that drive, that portion's old data is now gone. This nor any other consumer software can get it back. kavka, It does not over write the data, but you need software to be able to get formatted data. If you look at a drive, in Windows platform for example, that you have formatted, it looks empty.You need software, such as this, to be able to get that data back. If you format a drive, and then write a new OS to a portion of that drive, that portion's old data is now gone. This nor any other consumer software can get it back. The FIRST and the ONLY calculator supports Retina display in the market.